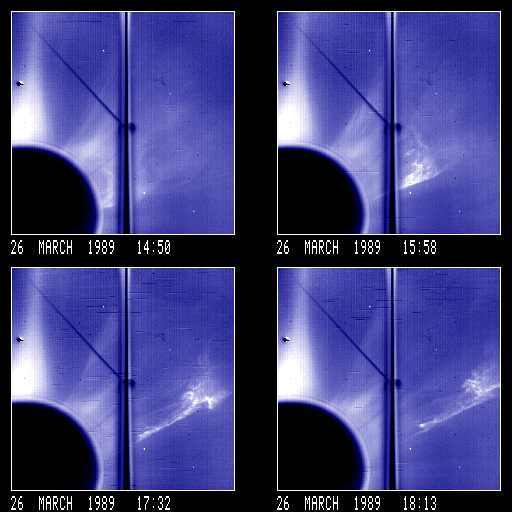 These four images illustrate the filament eruption that accompanied a coronal mass ejection over the west limb of the sun on March 26, 1989. Solar north points toward the upper left corner in each image. Structured cloud with possible concave-outward shaped cavity at southern edge from 14:50 to ~16:40. Loop/cavity or mound appears at 14:50 containing highly structured, loop-shaped (prominence) core. Southernmost edge of (prominence) core evolves into bright hook shape. Event is superposed on streamer. Streamer is disrupted. Deflections. March 26, 1989: 21:03 UT March 26, 1989: 4 pictures in one frame.